Personalized 6x20 Vertical Address Plaque - - custom made narrow house number sign holds four 4" high numbers. Made in USA. Fast turnaround; ships in 2-3 days. Customized with your choice of color and numbers you specify. Made from sturdy, UV-stabilized 1/8" laminated acrylic with engraved personalization. Nine vivid color combinations: black with gold characteers; sky blue with white characters; black with white characters; white with black characters; brushed gold with black characters; brushed stainless with black characters; kelley green with white characters; red with white characters; and yellow with black characters. Border is the same color as the numbers and accentuates the rectangle shape. Comes with 3/16" diameter fastener holes and mounting screws. Dimensions: 6"W x 20"H x 1/8" thick. 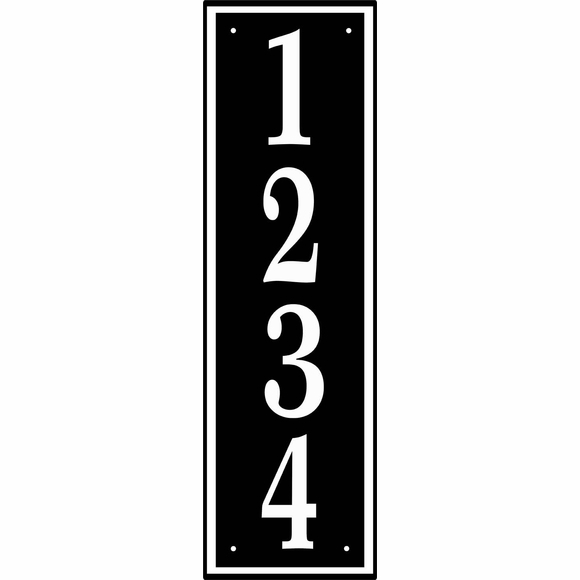 Personalized Vertical Address Plaque for narrow spaces such as pillars. Custom made for you in the USA from sturdy and UV-stabilized laminated acrylic. Engraved personalization.